Bojdys, M. J.; Hasell, T.; Severin, N.; Jelfs, K. E.; Rabe, J. P.; Cooper,* A. I. Chemical Communications 2012, 48, 11948-11950. The characterisation of porous crystalline solids often relies on single crystal X-ray diffraction, which does not give direct information about the surface of the material. Here, crystals of a porous organic cage, CC3–R, are investigated by atomic force microscopy and shown to possess two distinct gas-solid interfaces, proving that the bulk crystal structure is preserved at the porous crystal surface. Ren, S.; Bojdys, M. J.; Dawson, R.; Laybourn, A.; Khimyak, Y. Z.; Adams, D. J.; Cooper,* A. I. Advanced Materials 2012, 24, 2357-2361. Porous, fluorescent, covalent triazine-based frameworks (CTFs) are obtained in an unprecedentedly mild reaction, opening up a scalable pathway for molecular building blocks previously thought incompatible with this chemistry. Choice of monomers and synthetic conditions determines the optical properties and nano-scale ordering of these highly microporous materials with BET surface areas exceeding 1100 m2 g-1 and exceptional CO2 capacities (up to 4.17 mmol g-1). This is the pre-peer reviewed version of the following article: Ren, S.; Bojdys, M. J.; Dawson, R.; Laybourn, A.; Khimyak, Y. Z.; Adams, D. J.; Cooper, A. I. 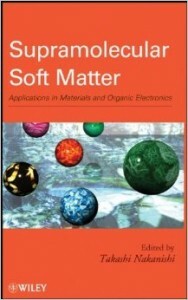 Advanced Materials 2012, 24, 2357-2361, which has been published in final form at [DOI: 10.1002/adma.201200751]. Bojdys, M. J.; Cooper, A. I. Diamond Light Source Annual Report 2012. 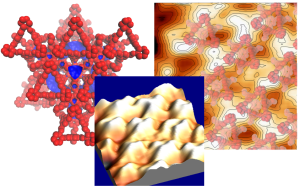 Our research on Supramolecular engineering of intrinsic and extrinsic porosity in covalent organic cages [Link] has been selected for inclusion as a science highlight in the Diamond Annual Review 2011/12. The Diamond Annual Review highlights key experiments which have taken place at Diamond Light Source. Reprinted with permission from Bojdys, M. J.; Briggs, M. E.; Jones, J. T. A.; Adams, D. J.; Chong, S. Y.; Schmidtmann, M.; Cooper, A. I. Journal of the American Chemical Society 2011, 133, 16566. Copyright 2011 American Chemical Society. Weber, J.; Bojdys, M. J.; Thomas, A. In this chapter, we describe pathways for the preparation of porous, polymeric semiconductors. Several examples that show high prospects for applications such as organic solar cells, organic light-emitting diodes (OLEDs) and organic field effect transistors (OFETs) have been reported and will be the subject of discussion. In the first section, an overview of the general methods of preparation for meso- and microporous polymers is presented. Several examples are shown illustrating the different synthetic strategies. The second section focuses on porous networks with pore walls composed of conjugated, semiconducting polymers. Here, the relationship between the development of a 3D organic semiconductor and porous semiconducting polymers will be discussed. The section also gives a comprehensive overview over known examples of porous semiconducting polymers which have not only been put to work in optoelectronic devices, but have also been successfully used as materials for gas storage or as catalyst support. The third section describes a particular type of porous conjugated polymers, namely, covalent organic frameworks (COFs). 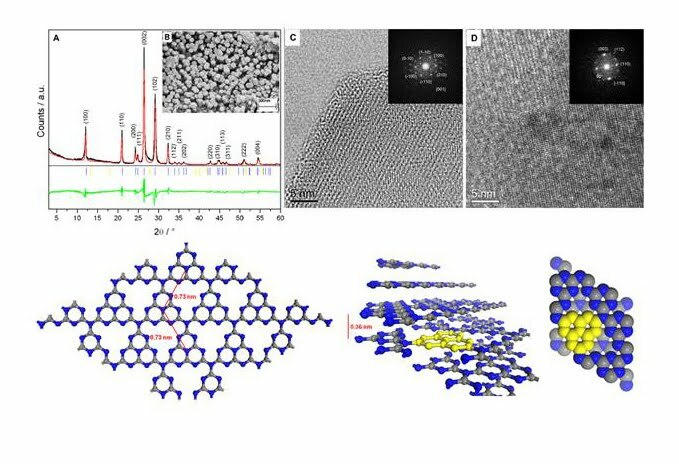 The last section discusses the organic semiconductor, graphitic carbon nitride. The semiconducting properties of this material have been recently extensively investigated and used for important applications, such as photocatalysis for the production of hydrogen from water. Bojdys, M. J.; Briggs, M. E.; Jones, J. T. A.; Adams, D. J.; Chong, S. Y.; Schmidtmann, M.; Cooper,* A. I. 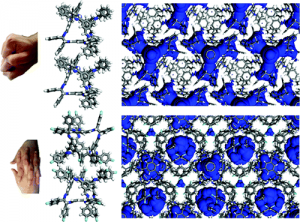 Journal of the American Chemical Society 2011, 133, 16566-16571. Control over pore size, shape, and connectivity in synthetic porous materials is important in applications such as separation, storage, and catalysis. 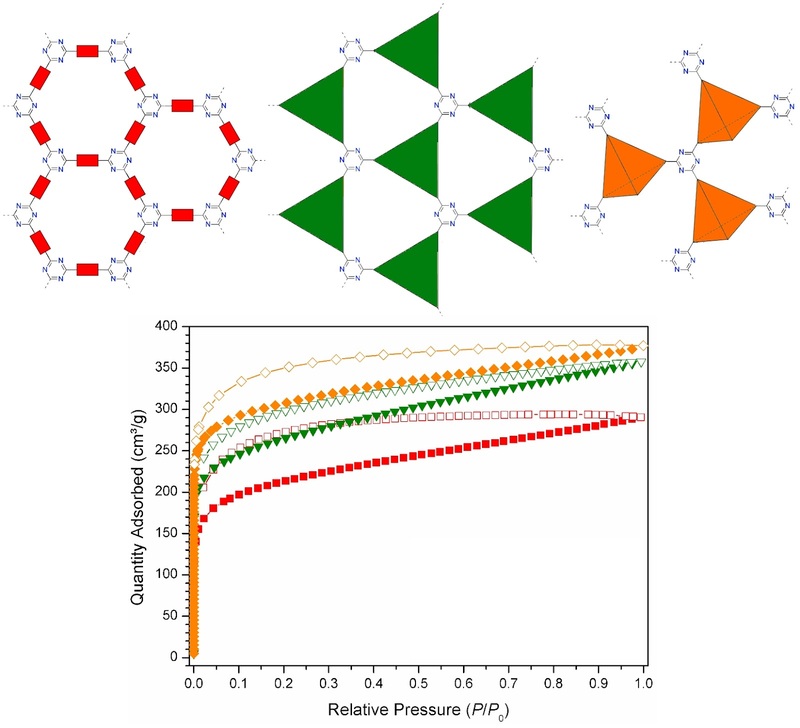 Crystalline organic cage molecules can exhibit permanent porosity, but there are few synthetic methods to control the crystal packing and hence the pore connectivity. Typically, porosity is either ‘intrinsic’ (within the molecules) or ‘extrinsic’ (between the molecules)—but not both. We report a supramolecular approach to the assembly of porous organic cages which involves bulky directing groups that frustrate the crystal packing. This generates, in a synthetically designed fashion, additional ‘extrinsic’ porosity between the intrinsically porous cage units. One of the molecular crystals exhibits an apparent Brunauer–Emmett–Teller surface area of 854 m2 g–1, which is higher than that of unfunctionalized cages of the same dimensions. Moreover, connectivity between pores, and hence guest uptakes, can be modulated by the introduction of halogen bonding motifs in the cage modules. This suggests a broader approach to the supramolecular engineering of porosity in molecular organic crystals. Reprinted with permission from Bojdys, M. J.; Briggs, M. E.; Jones, J. T. A.; Adams, D. J.; Chong, S. Y.; Schmidtmann, M.; Cooper, A. I. Journal of the American Chemical Society 2011, 133, 16566-16571. Copyright 2011 American Chemical Society. Sun, C.; Bojdys, M. J.; Clarke,* S. M.; Harper, L. D.; Jefferson, A. Langmuir, 2011, 27, 3626-3637. Differential scanning calorimetry (DSC) and X-ray powder diffraction (PXRD) have been used to determine the phase behavior of the binary mixtures of undecanoic acid (A) and undecylamine (B) in the bulk. In addition, we report DSC data that indicates very similar behavior for the solid monolayers of these materials adsorbed on the surface of graphite. The two species are found to form a series of stoichiometric complexes of the type AB, A2B, and A3B on the acid rich side of the phase diagram. Interestingly, no similar series of complexes is evident on the amine rich side. As a result of this complexation, the solid monolayers of the binary mixtures exhibit a very pronounced enhancement in stability relative to the pure adsorbates. Reprinted with permission from Sun, C.; Bojdys, M. J.; Clarke, S. M.; Harper, L. D.; Jefferson, A. Langmuir, 2011, 27, 3626-3637. Copyright 2011 American Chemical Society. Bojdys,* M. J.; Wohlgemuth, S. A.; Thomas, A.; Antonietti, M. Macromolecules 2010, 43, 6639-6645. 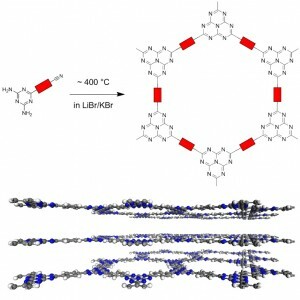 Layered two-dimensional polymer frameworks were formed on the basis of the thermally-induced auto-condensation mechanism of heptazine (C6N7) in a salt melt of lithium bromide and potassium bromide from three different molecular building blocks. The backbone of the materials is based on strong covalent bonds (C-C, C-N) resulting in high thermal stabilities (< 600 °C) and low bulk density, but no accessible pores. Reprinted with permission from Bojdys, M. J.; Wohlgemuth, S. A.; Thomas, A.; Antonietti, M. Macromolecules 2010, 43, 6639-6645. Copyright 2010 American Chemical Society. Bojdys,* M. J.; Jeromenok, J.; Thomas, A.; Antonietti, M. Advanced Materials 2010, 22, 2202-2205. 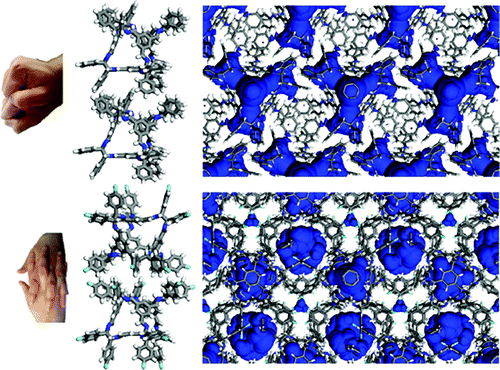 A layered, covalent, triazine-based framework (CTF) was synthesized via the condensation of 2,6-naphthalenedicarbonitrile under ionothermal conditions. 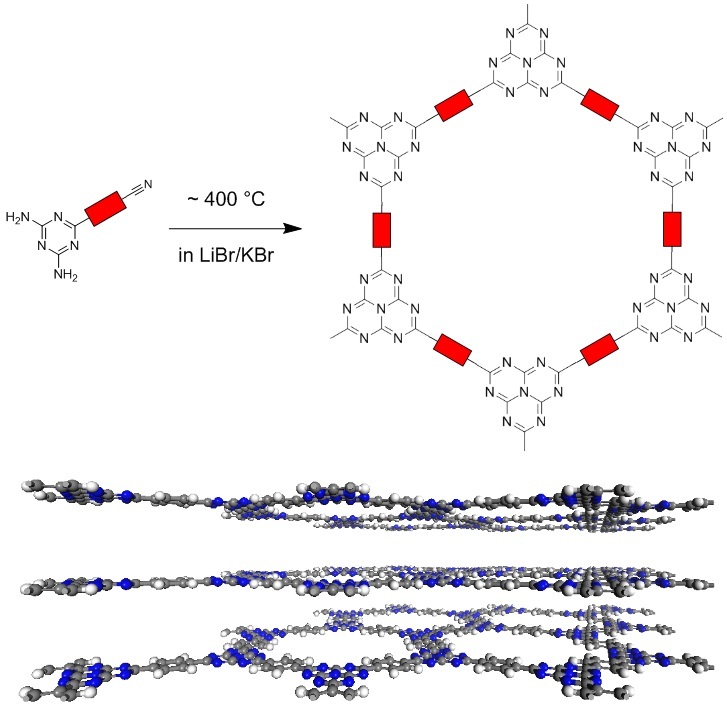 The polytrimerization of this bi functional carbon nitrile in zinc chloride at lower temperatures yields a well-ordered, close-packed framework. At elevated temperatures an amorphous, yet porous solid is obtained, which shows remarkable thermal stability (640 °C) and a high surface area (2255 m2 g−1 and 1.51 cm3 g−1). This is the pre-peer reviewed version of the following article: Bojdys, M. J.; Jeromenok, J.; Thomas, A.; Antonietti, M. Advanced Materials 2010, 22, 2202-2205, which has been published in final form at [DOI: 10.1002/adma.200903436]. Bojdys, M. J.; Muller, J. O.; Antonietti, M.; Thomas,* A. Chemistry-A European Journal 2008, 14, 8177-8182. 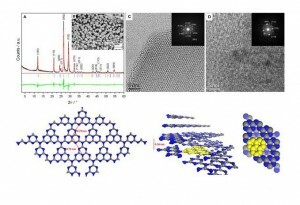 Herein we report the synthesis of a crystalline graphitic carbon nitride, or g-C3N4, obtained from the temperature-induced condensation of dicyandiamide (NH2C(=NH)NHCN) by using a salt melt of lithium chloride and potassium chloride as the solvent. The proposed crystal structure of this g-C3N4 species is based on sheets of hexagonally arranged s-heptazine (C6N7) units that are held together by covalent bonds between C and N atoms which are stacked in a graphitic, staggered fashion, as corroborated by powder X-ray diffractometry and high-resolution transmission electron microscopy. This is the pre-peer reviewed version of the following article: Bojdys, M. J.; Muller, J. O.; Antonietti, M.; Thomas, A. Chemistry-A European Journal 2008, 14, 8177-8182, which has been published in final form at [DOI: 10.1002/chem.200800190].